Today, when you order "MENDACIOUS by AJ and Abhinav", you'll instantly be emailed a Penguin Magic gift certificate. You can spend it on anything you like at Penguin, just like cash. Just complete your order as normal, and within seconds you'll get an email with your gift certificate. SATELLITE SIGNAL: 3 spectators stop at three random cards (no forces) and send their thoughts to the performer (all at once). The performer receives the thoughts and finds the cards. Not only that, the performer figures out which cards belong to each of the 3 spectators. Mr. MIRACLE: A selection gets predicted even before the selection is made. Then it disappears from the deck and reappears at a specific spot in the deck while the performer is nowhere near it. WD COMPATIBLE: Two spectators sign two freely selected cards, one on the face and the other on the back. Later it is revealed that they both have signed the same card! 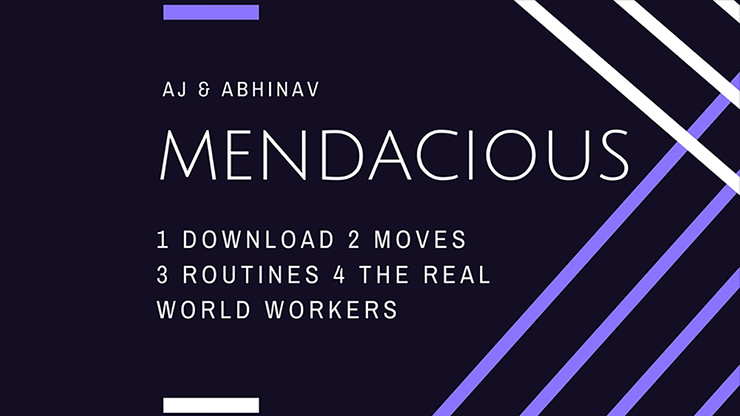 All the routines are impromptu and are primarily achieved using the two moves in the download. Satellite Signal is intended for parlor/stage (wide audience), while the other two are for close-up/walkaround. The download consists of an 18-minute-long video that explains each aspect of the moves as well as of the routines. Also included is a super-short PDF file for further help in the learning process. A lot of nice card controls. I like to watch every magicians way of doing controls. You often see little touches that improve your own performance. This is cheap and excellent value.